It’s not bad, really 😎 Just means there is only so much that can be done each day. So much has happened in the last 6 months it’s flown by but progress has been made. It would seem Commander 1.0.9, Violet Exchange and ATLAS Hive will all be ready at the same time! I did not plan it this way, fluke. I’ve stripped back some features in Violet Exchange for stability, I’ll add more bot commands post release. 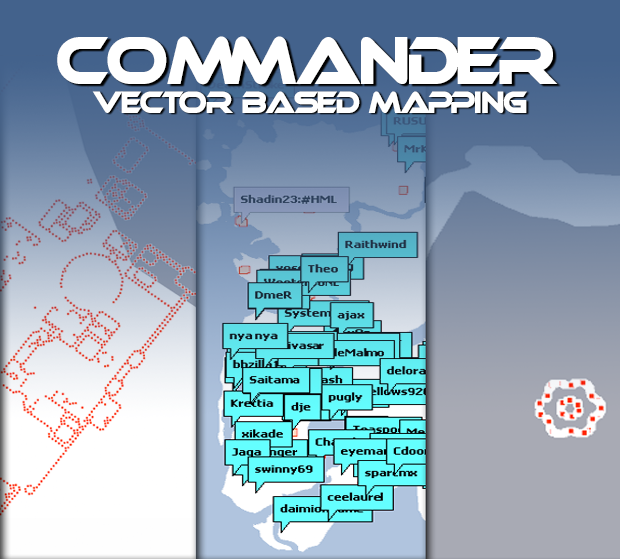 Commander will be lacking some maps but that will change post release too, I got some help. ATLAS Server Control (ASC) was created out of necessity, my own Atlas cluster desperately needed a method to take care of the servers. Like most things, I went overboard and threw the kitchen sink in. This is not your average game server, there are a few 3rd party components required to get it all working and larger maps that require many physical servers. Launching, monitoring, updating and detecting crashes is ok for 1 machine, but what about 20? I’ve developed a way to link ASC clients to a master client, so the cluster can be managed from one place as a whole (even from home). Preliminary code is working great, it needs error handling and some handshake functions on the socket (connection establishment stuffs) oh, and encryption duh. Note: While you are able to see what the remote servers are doing, start/stop/update and syncing them with ASC is a premium feature for Patreon. Programming requires copious amounts of chocolate, coffee and oxygen – for as little as $1 I get to eat chocolate and you get to become a super admin. If you want to share your lunch with me, smash that Patreon banner on the front page (just below the #1 Aussie Host). Hey wait, what about Glider??? huh? Yes, umm well since I slapped together a better map control for Commander that lets me get my vector on, I realized Glider would benefit greatly with this control. Soooo, once I’ve released Commander, I’ll revisit Glider and with a bit of luck, not get VAC banned again. Hello everyone, quick update regarding the next Commander release. ATLAS support has been implemented and working as it should, this was a little more involved than just adding the blueprints. Atlas has a whole new raft of specific commands that needed a home and Ark had filled all the space, so Commander will now reshuffle its interface based on which game your playing! Atlas mapping will also be coming to Commander. It’s been quite a while since I’ve updated my blog, many things have changed in my life and for the better. I’ll start off by saying the support I’ve received for this project has been nothing short of amazing, the team of volunteers that formed around me, assisting in all aspects of community management, software support, gameplay tips and ideas (deep breath) I cannot thank you enough, without your support Commander would be a skeleton of what it is today! Another round? Violet Exchange is now being tested for the final time before I release it to Patreon. Violet will provide the mapping data to Commander clients who possess the server key, it will allow them to visualize all objects on a map. A nice zoomable map with no limit on what you can display, foundations, players, dinos and all the stats associated to each. In addition, you can manage your server with discord bot commands, my favorite is the “Report Crashlog Kill PID” command, admins will come to appreciate this feature. Glider is sitting on the shelf at the moment, there is too much going on with Commander and Violet for me to allocate any time to it. Its possible the new mapping control will be transplanted into Glider, hopefully making the manual keyframing less clunky. Grab it on the Downloads Page, lot’s of fixes and a couple of additions. 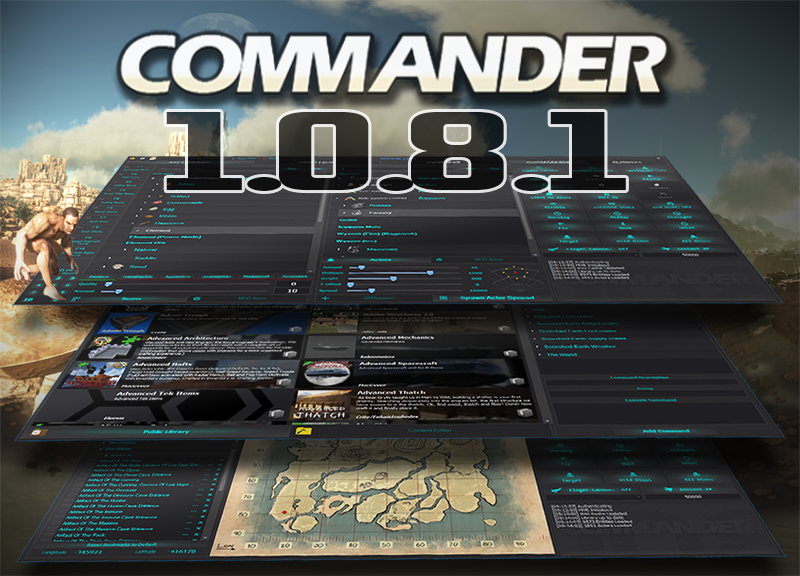 I have coded an updater into Commander, so it will let you know when a new version is available. More work will be done following this release, finalizing the leftovers and tweaking the interface to the general publics liking. Basically, if I held on to this any longer, I was going to be lynched O.O ! 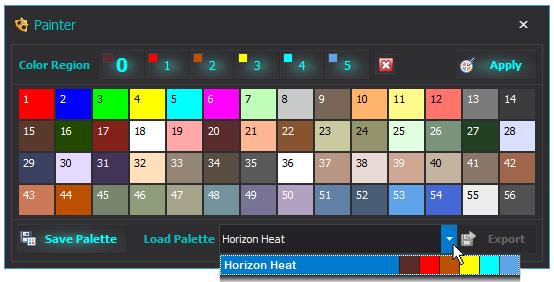 The Painter has had some much needed love and now represents the ACTUAL colors in-game. New Commander version to drop this weekend. (including all the bits I was unable to bugfix and complete). I cannot sit on this any longer, the time is now, 1.0.65.1 has been a good donkey. Time for a Horse! Hey Wildcard, I was on my toes already! Mapping system, Wildcard snuck in a map version change so we’re now on v8. Good to know, fixed.. We move on. Infinite Stats and God Mode buttons are back for those who like finite control, purists rejoice! Also fixed an issue when searching for dinos on the map, you’ll find that ptero now. For the launch of ARK: Survival Evolved, Wildcard partners Snail Games have teamed up with the award-winning PIXOMONDO team, including Executive Producer Mandie Briney, the VFX Supervisor from Game Of Thrones Sven Martin, and CEO Thilo Kuther, who worked closely with the creative team from JOJX, including father+son directing team Rocky+Jackson Morton and EP Joe Care to create the concept, the script, to execute this cinematic and thrilling trailer bringing the ARK: Survival Evolved world to life.